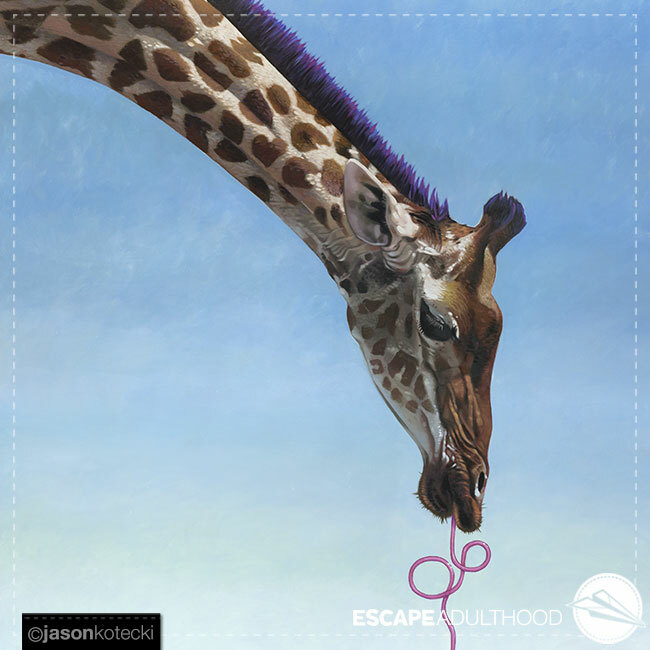 “A Little Whimsy” by Jason Kotecki. 40″ x 40″. Oil on canvas. Friend, the moment we have fully succumbed to Adultitis is the moment we turn down a twisty straw for a regular one. 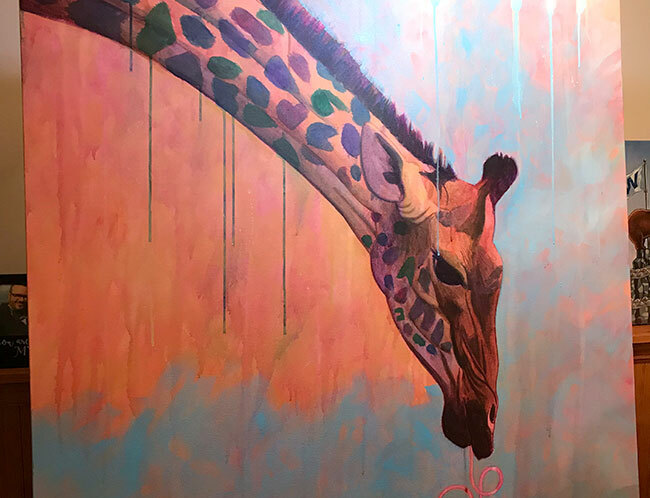 Perhaps you noticed the mane on this giraffe is pink and purple. In the early stage of this painting, the spots were different colors, too. But as the piece developed, I decided to go with more natural colors. Except for the mane, of course. And that whimsical twisty straw. If there’s one message I’d like to drive home, it’s the power of a little whimsy to transform our business, environments, and lives. Would you like to generate a little bit more positive word of mouth for your business? Maybe improve employee morale and engagement? See your customer satisfaction ratings rise? Attract more people to your association or cause? Would you be interested in making life feel a little bit more magical? Here’s the secret, folks: Add a little whimsy. As much inspiration as I get from children, I am an adult. I like to think I’m a little more sophisticated than I was when I was five. Sometimes people who hire me for an event get all excited about the theme and overdo it with primary colors. Our lives don’t need to look like kindergarten just threw up on it. Too much whimsy and no one takes you seriously. Just the right amount and the world takes notice. See what I mean? I think the U.S. walk signs have Adultitis. It’s a subtle difference, almost imperceptible, but I’d much rather be the fellow on the left, wouldn’t you? Just a little bit of whimsy is enough to remind you of the child that still lives inside. The one secretly sticking its tongue out at your idiot boss. The one that knows that even though you have to fill out that tax form doesn’t mean you have to like it. The one that believes in having fun simply for the joy of it. Something like wearing colorful socks, dying a pink streak in your hair, or adding some stickers to your laptop lets Adultitis know there’s a new sheriff in town. On the whole, it’s tempting to see these little touches as frivolous, superfluous, insignificant. But they actually do something quite important. They have the power to uplift the human spirit. In an age of name-calling, protests, and red states vs blue states, we need that now more than ever. Whimsy is divine, and you can see it time and time again in creation: the platypus, the giraffe, a pig’s tail, and the infectious giggle of an infant. Look at yourself naked in the mirror and tell me God doesn’t have a sense of humor.